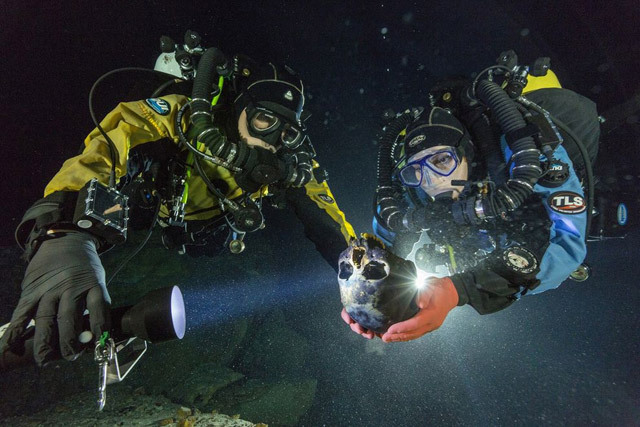 Ancient skeletal remains of an adolescent girl discovered in an underwater cave in Mexico may help uncover the identity of the earliest American inhabitants. Naia (ancient Greek for ‘water nymph’) was found a half mile inside the caves located on Mexico’s Eastern Yucatan Peninsula. Her remains are 12,000 to 13,000 years old, making it the most complete skeleton ever found from that period of time. Many ancient skulls found in the Americas have features that resemble native peoples of Africa, Australia, and the southern Pacific Rim rather than the familiar Native Americans. Naia, however, has both the craniofacial features of the early Paleoamericans as well as the mitochondrial DNA of later Native Americans, suggesting 9,000 years of evolution rather than separate migrations of different people.